Growing up with a chronically ill mother, I found it very difficult to embrace Marian devotions as an adult. A true and present (and perfect!) mother did not seem real to me. Just as a faithful father reflects the love of God the Father to his children, a faithful mother reflects the love of the Blessed Mother to her children. Though I was blessed to be raised by devout Catholic parents, some of those devotions were lost amidst the care my mother needed. I honestly did not know what I was missing. As Catholic women, we have an incredible role model and while she can be a very daunting one given that she truly is the perfect woman, when we walk our vocation with her we find a mentor whose strengths exactly match our own weaknesses and shortcomings as mothers. In my journey I have been blessed to meet a number of “Mary’s” – women whose faith life, perseverance, joy, and devotion surpass my own. But because they are Mary’s, they hold out a hand to pull women like me along with them and we end up better people, better Christians, because of it. Over the years these friends have made the Blessed Mother very real to me and developed within me a longing to be like Mary, because I so want to be like them. Allow me to introduce you to one of my Mary’s: Kim. Kim is a funny lady. A smile seems to be permanently etched on her face and a witty comment rolls off her tongue like chocolate from a fondue fountain. She is married to a faith-filled man and has six precious children on earth and two awaiting her in Heaven as well. When I first met her, she was a leader in our homeschool group. Always the organizer, she helped with co-ops, plays, field trips, father/daughter dances, mother/daughter teas, and classes — all while volunteering at church and other faith-based groups. I never saw the woman stressed. She and her husband, Mark, knew there were some medical issues with a few of their kids; they had known the sorrow of miscarriage and then welcomed the blessing that was number six. Little Erica was born with mitochondrial disease which Kim found out later affected several of her children and family members; it was just more pronounced in Erica. Family life began to revolve around hospital stays, doctor visits, life-threatening illnesses, sketchy diagnoses and prognoses. One step forward was usually followed by two back. Up and down with precious Erica’s care — all the while caring for her other children — and never a hint of anger, resentment, frustration or resignation. Always hope. Erica has defied many odds and is a lively little four year old girl. Developmentally delayed, she brings a grace of her own to all who are blessed to know here. With her bow on top of her piggy-tailed head, her thick glasses, and her catheter peeking out from the top of her shirt, she smiles mischievously and grabs your hand for a walk or hugs you impulsively. Her parents and siblings speak her exclusive language, but anyone with a heart beating can feel her meaning. As I run into Kim at church she is chuckling about the latest miracle. It seems God woke her up in the middle of the night so she felt called to check on Erica, as she did she felt the child’s sheets and knew they were wet…when she looked closer she found it was blood. Erica had pulled out her pic line. If Kim had not checked on her she would have bled to death in her own bed. “Isn’t that a miracle that God woke me up when he did?! And Erica is back to herself. It’s all good.” She smiles as she says this knowing it is simply another step in their journey with Erica. Recently I went to dinner with Kim and some friends – we sat around the table sharing our stories about our children. The latest prognosis for Erica is not positive. If (yes, that is an IF) she makes it to age ten she may level off and be able to progress. The doctor feels it more likely she will not, that as her tiny body grows, she will not be able to take in the nutrition needed. Kim’s response? “We just told the kids that each moment we have with Erica is precious. We are not putting things off to wait for her to get to a certain point health wise, we will enjoy each and every moment God gives us with Erica.” She then goes into a hilarious story about Erica stuffing her toilet with feminine products. Is Kim not living in reality? Is she running from the inevitable? Does her cheery disposition hide an agonizing heart? Will she ever cry out to God begging to know why she must endure this cross? She already had kids who needed special attention; shouldn’t God have given her a break? Dealing with various health issues with her other children and insurance and all kinds of different specialists and doctor visits and hospital stays and uncertain test results and emergency situations of all kinds with Erica while battling sleep problems herself. Why can’t she catch a break? Kim isn’t nuts. She is Mary. When she said yes to her fiancé, when she said “I do” on her wedding day, when she joyfully accepted new life within her, when she gave new life – too soon – back to God, when she embraced a newborn with tubes of all kinds and challenges ahead (more than once), when she fights for the care her daughter deserves, when she carries a cross of uncertainty she does this, and so much more, with the faith of Mary’s Fiat. Yes, Lord….be it done unto me according to your word. Kim may be running, but she runs towards the cross not away from it. Just like Mary. Devotion, prayer, retreats – these have built up a store of graces from which she can draw her daily strength. As the family’s older children look on, a mother and father’s love are lived through every tube feeding. As they make it through yet another medical crisis, they form in faith the young witnesses under their own roof. Kim is an outgoing person, her natural inclination is to reach out in faith to those outside her home, but she now embraces the mission field to which God has called her: home, babies, children. Saints are formed in such conditions. Where does this spirit of acceptance with joy come from? Mary. The first and best disciple, Mary teaches us all that suffering has meaning, that a life guaranteed to be difficult has immense value in God’s eyes, that a mother’s pierced heart bleeds grace when offered as a willing sacrifice to God. Kim’s daily life is her Magnificat. In a God-incidence validating this, when artist Sally Kazin needed models to help with the lighting for her portrait of the Holy Family, Kim, her husband Mark, and baby Erica posed for her. 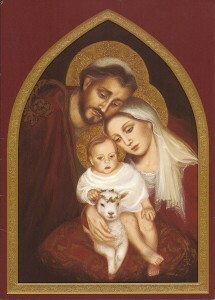 The resulting picture was used on the Archdiocese of Atlanta Christmas card in 2008. Does Kim struggle? Yes. Does Kim get overwhelmed. I think so. Does Kim cry for strength to follow the path God has laid before her? I am sure she does. I do not know these things because she has shared them with me, but because I cry to myself when I ponder carrying her cross. Her very existence challenges me to the core! How well have I built up the fortress of my faith? Is there reserve enough to get me through an unexpected life crisis? Do I truly live what I profess? And I mean every day, in every moment, in every situation and with everyone God places in my path? Could I lay down all I want to do and take up all the God asks me to do? The ripple effect of Kim is mind boggling: every doctor’s office receptionist, every nurse, every doctor, every specialist, every therapist, every surgeon, every anesthesiologist, every radiologist, every insurance company customer service representative, every drive through she hits on the way to various doctor appointments. There’s the repair man who apologizes for falling through her upstairs ceiling while fixing their cable! She asks if he is okay and points to little Erica with all her tubes and tells him that she has taught their family to worry about people, not things… and is he okay? Can she help him?. All of these people are touched by a woman whose faith leaves the most loving mark — of Mary. All witness her steadfast devotion, her grip on reality and the fact that she knows the Creator of Heaven and Earth holds her Erica at all times in the palm of His hand. 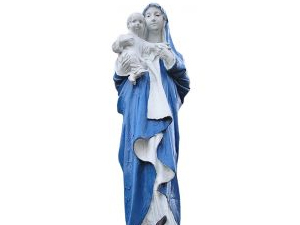 Lest anyone feel I am elevating Our Lady above her due I quote Pope Benedict XVI: “Mary’s greatness consists in the fact that she wants to magnify God, not herself.” Kim does the same. Even with some tears she says easily that this is what God has chosen for their family, this is their path to sainthood, and they will walk it in faith. Who are the Mary’s in your life? I have been blessed with so many who have, by the living of their professed beliefs, led me — at last — to a better and stronger devotion to Our Blessed Mother. I still do not feel I have the faith needed to be to Kim what she has been to me but I still offer this prayer: Lord, I cannot be a Mary to Kim….but please help me to at least be a Simon. Wow, Ms. Kelly does it again! She has written another beautiful piece that is thoughtful on so many levels. We must strive to be like the Blessed Mother Mary, but really are blestBlessed Mother is more than willing to lead and guide us spiritually if we only ask. I am just so grateful, along with Ms. Kelly, that the Lord, in His generosity has gone above and beyond and given us additional “Marys” to make these important vocations we have flourish! I have a few Mary’s in my own life, the author of this article being one of them. I know that I am blest beyond measure!